Social media moves fast. How fast? It seems like only yesterday we were talking about the importance of video marketing, and already there are experts who say that the next frontier is not just video, but rather live video. If video marketing itself seems daunting to you, you might be inclined to dismiss the idea of live video. Not so fast! Today I have an excellent interview with Kim Garst from Boom! Social who is demystifying Facebook Live and sharing top-notch advice for how you can get started. After reading the article (and listening to the interview), your fears will be calmed, and you will be completely convinced that live video is something your small business needs to try. As mentioned above, Kim Garst is the founder and CEO of Boom! Social, a personal branding and social media consulting firm. She also authored the book Will The Real You Please Stand Up: Show Up, Be Authentic and Prosper in Social Media. She is a social media expert, but she admits that she did not become one overnight. “I struggled, when I first started, with the learning curve. The learning curve can be pretty steep, and certainly, more so today because there are so many pieces and parts,” she says in the interview. This is why she is on a mission to shorten the learning curve for others, helping business owners to learn how they can monetize the relationships that they form on social media. In our interview, we talk specifically about Facebook Live and Kim shares several tips for small business owners who are getting started. You can listen to the full interview by clicking below. But first, you may wonder WHY live video is so important these days. The answer to why live video is so important to businesses is because your customers love it! Live streaming has been around for a long time now, but the difference maker was when Periscope, Meerkat, and other apps emerged. These platforms made it easy for virtually anyone to “go live,” delivering content and engaging with viewers in real time. Facebook actually came into the game later, but this allowed them to learn from Periscope’s mistakes when they created Facebook Live. The fact that it is housed on a hugely popular social media platform gives added perks compared to smaller live streaming apps. It is part of a pattern we have noticed where Facebook is increasingly favorite video at a content format. An important Business 101 lesson says that people buy from those they know, like and trust. Establish those three things and you have won a customer for life. This is the reason why live video is so important, especially for smaller businesses. The chances are that you’ve set up your social media accounts, but many of you are also not seeing any traction because it takes a while to establish yourself with customers. However, live video gives you the opportunity to build the ‘know, like, and trust factor’ at an accelerated rate. The reason is that when a person sees you, they can better assess your business on a personal level. They can see you; they can get a feel for your authenticity; they get a feel for the value that you offer them. The personal element of live video allows connections to form faster and stronger than any other method of social media interaction. 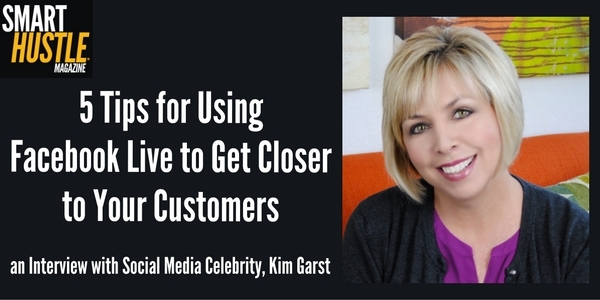 Great #LiveVideo tips from @KimGarst. Check them out and more great #advice in this #interview. You can’t deny the incredible benefits of live video, but you still may be wary of giving platforms like Facebook Live a try. Kim’s advice is sure to help you overcome your fears. Many people are afraid to go on live video because people will be looking at them. The truth is, nobody cares about the way you look as much as you do! Nobody cares if your nose is shiny or your hair is sticking up – they are interested in what you have to say, not how you look. Of course, this is not to say that someone won’t comment on something from time to time, but it is actually pretty rare, and that person isn’t your ideal client anyways. Another concern might be that you can’t plan live video in the same way you can a ‘static’ or pre-recorded piece. But that’s the whole point! Live video is wildly popular because people are tired of the perfection they see in static videos. The polished elements seem unreal, and they are looking for something authentic. In a live video, you may have to wing it, and things may go wrong (Kim even recalls a live video she was shooting when her entire tripod toppled over!) However, this is how you become relatable to your audience and earn their trust. Live video doesn’t have to be completely spontaneous, though. In fact, you should do ample planning before hitting that live stream button! For example, you must plan your goals before you start, which will help guide the video and the follow-up marketing. Are you looking to increase engagement? To give back to your community? To build your list? To grow awareness? Set your goals and then plan your video accordingly. Not sure what topic you would cover in a live video? How about choosing a topic you would have covered on your blog anyway? You would have traditionally sat down to write and spent 3-4 hours getting everything prepared and posted on the website. Do a video instead! You know your stuff, and it will come across in more of a human tone when you are speaking directly to your audience. Another thing people worry about is, “What if no one watches my live video?” Well actually, that doesn’t matter at all. Even if you only have a few people watching, there are tons of things you can do with the video afterward. Kim tells us, “You can literally take one 20-30 minute block of time and turn that into 70 pieces of content.” How? Put the video on YouTube, put it on Vimeo, embed it on your website, transcribe it into a blog post, gather tweetable quotes for social media, turn snapshots into visual content for Pinterest, and so on. This goes back to the planning part (Tip #3). Not only should you plan your goals and the general structure of the live video, but you should also plan out the many ways you will use the content afterward. Hopefully, by now some of your biggest fears have been squashed. You need to understand the huge potential of live video. For example, one time Kim did a product launch as a live video. She made five figures in just 12 minutes. I hope you have enjoyed these tips from Kim Garst, but there are plenty more gems of wisdom in the full interview! Give it a listen by clicking “play” above to boost your confidence and your excitement about live video and how you can use it for your small business.